I found this presentation while reading this excellent post on the Contrast blog. If you liked that, you might be interested in Designing for Social Traction. A few days ago my friend Don sent out a Twitter message linking to this crazy funny video. The video shows “homeless” developers with cardboard signs saying things like “Every day my boss changes his mind about what we’re building.” The somber piano music only adds to the effect. Here at the office Tom occasionally has to write Regular Expressions. 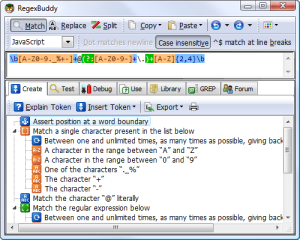 He’s come to depend on a tool called RegexBuddy (for Windows) which he purchased for only $40. A really great value when you consider the time he’s saved. Here’s a few links about Ruby on Rails vs. Other Languages which I received from a Ruby on Rails developer we are working with on a separate project. David Heinemeier Hansson – Ruby on Rails resources. PHP vs Ruby – Nola Stowe – has a number of articles comparing various technical aspects of Ruby and PHP. Today, I designed the settings page for our web application. On this page you can enter and change your username and password, view billing receipts, change your credit card, export your data (in CSV format), and also upload a user picture. For the user picture, we’ve decided to go with the typical square image, since that’s what everybody is familiar with. 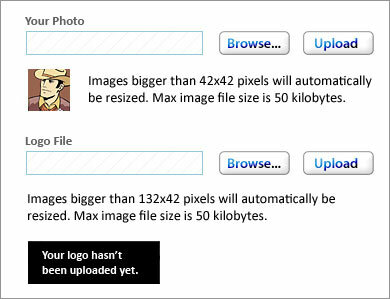 We’re thinking about trying something unique, and that is to also allow you to upload an image of your logo. It’s unique because only you will be able to see it. As you can see, we allow people to upload two images. The image of the cowboy just might be our default user profile picture. We’re still trying to decide. What should we name him? That’s an example of how it will look once you integrate both images into the header. It’s a nice and clean look, and is one of the ways people can personalize the web app. Several web applications have begun using Amazon S3 for all of their data storage needs. It’s a fascinating idea because they offer incredible prices for data storage, all o fthe redundancy and backup you could ask for, and remove the cost of dealing with hard drives, computers, and backup ourselves. I’m not quite sure yet whether Amazon S3 can store a database, and what it would really cost considering all of the constant data transfer, but if Amazon S3 can handle what we want to do, and for less cost, we may consider using it for Roundup. It would enable us to scale easier and without the added cost of additional servers and infastructure.